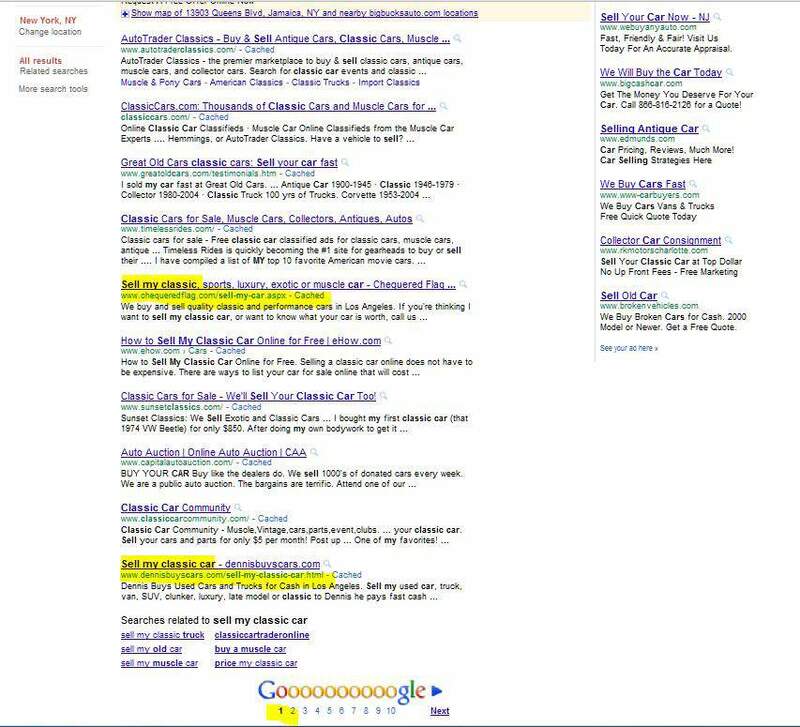 Top Organic SERP is the Holy Grail of search engine marketing. Everybody's looking for whatever it is they want on the web with search engines like Google, Yahoo and bing. Today, in order to remain competitive, your business website needs to be found online by the consumers already searching for the products and services that you sell. And that's just what NickWebWorks SEO web design Los Angeles helps you do - GET FOUND ONLINE. Clean code has the strategic advantage that, quite simply, Google prefers it and ranks higher! This modern code technique is based on semantic html and css, replacing bloated script code with style sheets. Give your website the "Clean Code Advantage" over your competition today. Nick Sharpe's web design service is search engine friendly original art, logos, graphics and relevant content (copy) all built with the Clean Code Advantage. In today's economic climate, the small and medium business owner needs every advantage they can get to get found online. View our gallery page to see the various types and styles of web design with SEO in mind. All have had the the Clean Code Advantage web design and all have ranked at or near the top for their market niche. See a style you like? Lets make an attractive and compelling website for your business today. Gets Chava Electrolysis Top Google SRP in 1 Week! "Web design with SEO in mind" is your relevant content written with semantic html and css, considered "clean code" by the web design community. This "white hat" code technique employs current industry best practices, which search engines like Google prefer. That can give your website the boost it needs in search engine results placement (SERP), giving you the "Clean Code Advantage" over your competition. Market research has shown that if your website is not in the top 5 of organic search results, then the chances of your website getting page views and clicks diminish dramatically. Most websites have been designed to razzle and dazzle you with eye candy, like flash elements or relevant content text displayed as images Google cant read (yet!). Focusing only on the visual design without a strong code foundation leaves out all the criteria Google, Yahoo and bing use to rank your website in search results. NWW's seo web design clients place high in Google SERP and delivers more proof that Nicks Web Works SEO web design "Clean Code Advantage" works! Of course, that depends on how competitive your keywords are so your mileage may vary. The facts are NWW clients enjoy high local and national SERP, in Los Angeles and all around the world. Chava's brand new NWW designed website was page one in SRP within a week of going "live"! "Chava" was a brand new 4 page website for a local small business crafted with NWW's seo Google friendly logo design, a brand new domain name (no "age" or history) and no blog or backlinks to speak of (the biggies of "off page" search engine optimization). She got her first client from the SERPs in a little over 2 weeks! Once again, in her market niche, content is king and we are the "Kings of Content"! After moving form Los Angeles to the bay area, Chava has moved once again from San Francisco to Roseville and Rocklin (metro Sacramento, CA). She needed an SEO update to be done quickly (Aug 25th) so Chava would get local SERP in time for her Grand Opening Sept 17 2011. 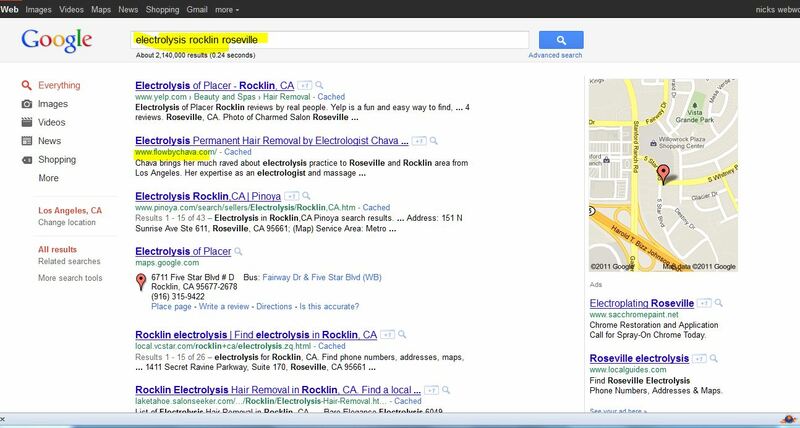 A search for "electrolysis roseville rocklin" has her #2 behind yelp! in organic SERP. Once again, NWW's seo web design gets top organic serp whether you are in Los Angeles, San Francisco or anywhere in the world. Semantic html + css = Clean Code Advantage! 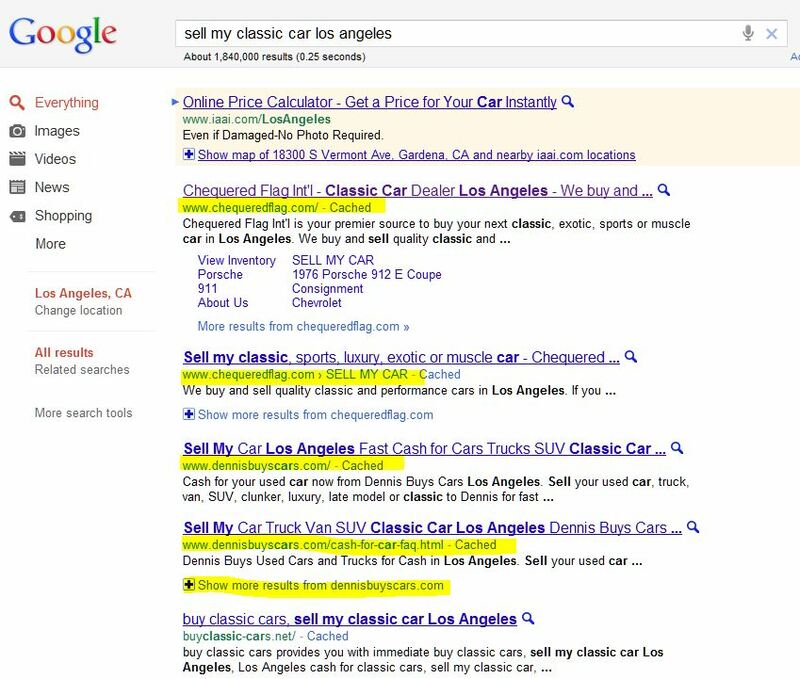 NicksWebWorks tops for "ORGANIC serp web design"
In the hotly competitive market that is car crazy Los Angeles, Nickswebworks' auto dealer clients rule local organic serp for their chosen keywords. Because these dealers prefer to buy their cars from private owners (as opposed to auctions, which can be problematic), "sell my car", "buy used car", "classic car dealer", "sell my classic car" are their primary keywords. They both rank well, and mostly page one SERP. But if you add "los angeles", they totally rule the page. Clik on this link to see seo web design proven results. 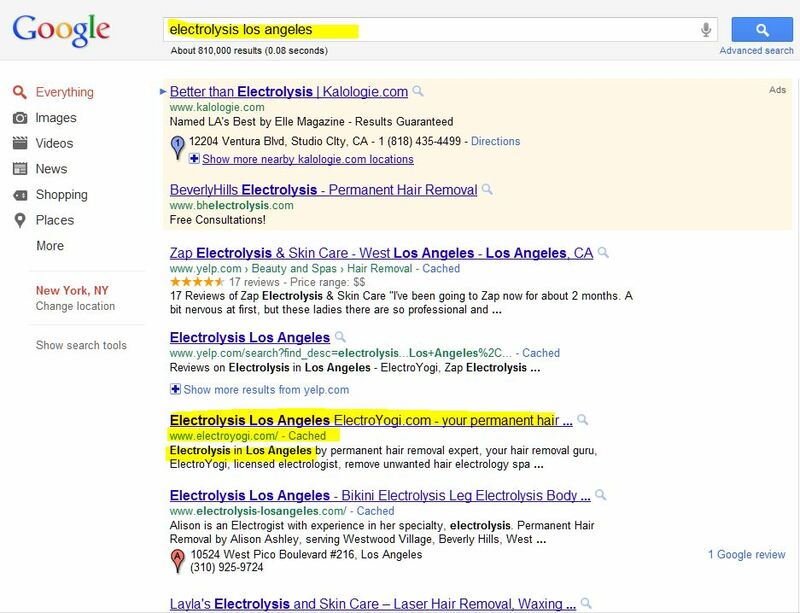 Nickswebworks gave Nicole P's "Electroyogi" electrolysis permanent hair removal salon web site our best deal for seo web design, our $199 "SEO Home Page Tuneup". That meant taking her GoDaddy "Website Tonite®" website that she designed herself (on a low budget), and cleaning out all the bloated WYSIWYG code, replacing it with keyword researched "Clean Code Advantage" content and html/css. That "Tune-Up", leaving her original design intact, took her site from virtual invisibility to the top organic serp that you see in this screen shot. Let Nickswebworks SEO Web Design for Top Organic SERP do the same for you! "Flow" by Chava gets top organic SERP for Roseville CA in The Sacramento Metro area. "OK smarty pants! So you got Local Search wired. What about nationwide?? hmmmm???" If you want accurate, reasonably unbiased search results, do this - Clear your browser history, clear your browser cache, sign out of Gmail (or whatever Google account is open) reboot your computer and set location for someplace far away... in my case, New York City. Here's an example of seo web design so strong, it crosses state lines. This image is only part of the page. 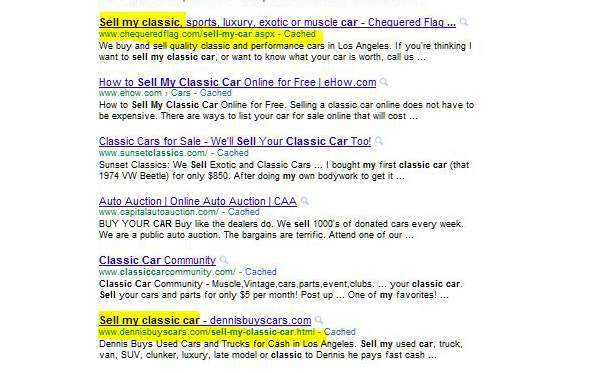 Click on the image to enlarge and notice out of 73,000,000 results for "sell my classic car", NWW clients Chequered Flag Int'l and Dennisbuyscars.com get page one SERP. The big deal here is that these are Los Angeles area used car dealers showing up in results of NYC... and ATL... and SFO, etc. Web design with SEO in mind gets top organic serp - wherever on the globe you may be.